The College Football Hall of Fame (CFHF) in Atlanta, Georgia (relocated from South Bend, Indiana in 2014) is, perhaps, best described as a more a place of worship than a museum. Of course, most sports halls of fame are more about veneration than education for a variety of reasons. 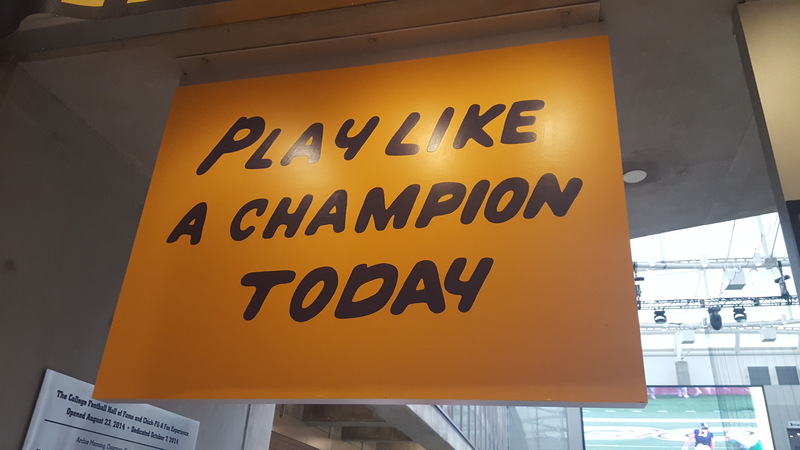 However, the College Football Hall of Fame takes this approach to a new level, as it very much is about experiencing and celebrating the meanings, traditions, and legacies of college football. There are, relative to the size of the museum, very few artefacts, and the displays – while familiar to most contemporary museum patrons – are less about sacred treasures and more about reliving and celebrating the past and present of the sport. 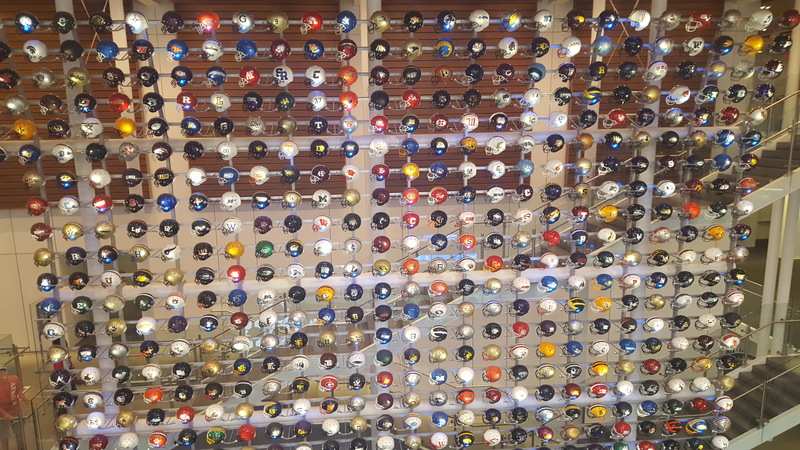 In fact, most of the collection – including the inductees themselves, as well as the many sights and sounds of college football – are entirely digital. Even more than that, they are personally curated based on your college football affiliation. To the uninitiated, college football in the United States involves – in theory – amateur competitions between institutes of higher education. However, the scale, scope, pageantry, and money (particularly for the coaches, administrators, broadcasters, sponsors, and many athletics programs) involved in college football are entirely professional. Different regions and conferences will have different football cultures – from styles of play to tailgating traditions. In addition, there are hundreds of college football teams throughout the United States – from internationally known programs like Notre Dame, Alabama, and Ohio State who fill 90,000 seat stadiums and attract millions of dollars in support, through to small division two and three programs which have limited spectatorship and financial support. Indeed, the challenge of a CFHF is that is has to be both general – in terms of representing the whole of college football – while also being specific to the recognizable teams, games, and athletes. The CFHF experience begins with a “log-in” procedure where your information – and fan affiliation – are recorded, both to personally curate your experience (each visitor receives a lanyard to wear that allows for swiping at interactive stations along the way) as well as collect visitor information – including contact information. Most visitors view a 10 minute video that provides visitors something of the experience of a college game day at a large stadium and university. Visitors can then view some of the famous trophies from college football, including the Heisman Trophy (awarded annually to the top player in college football). A large part of the museum space is dedicated to fan traditions, such as tailgating and team fight songs, and there is also a section on college football bands and cheer teams. 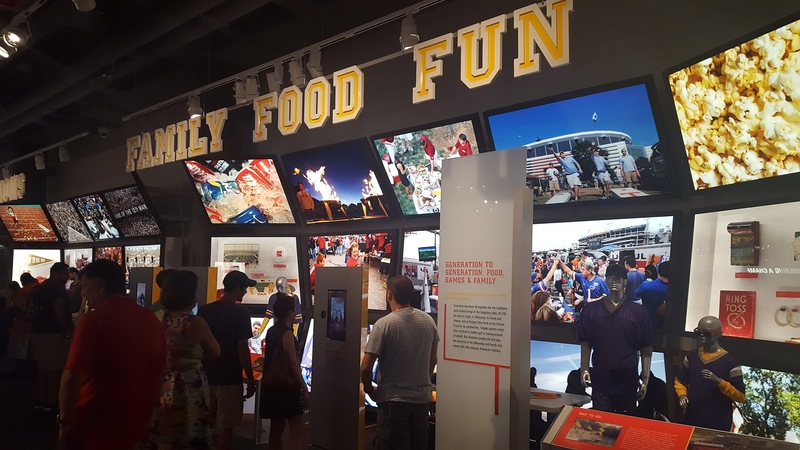 Visitors then proceed through a section about college football coaches, training regiments for college football, the evolution of college football equipment, college football rivalries, and famous college football broadcasts. 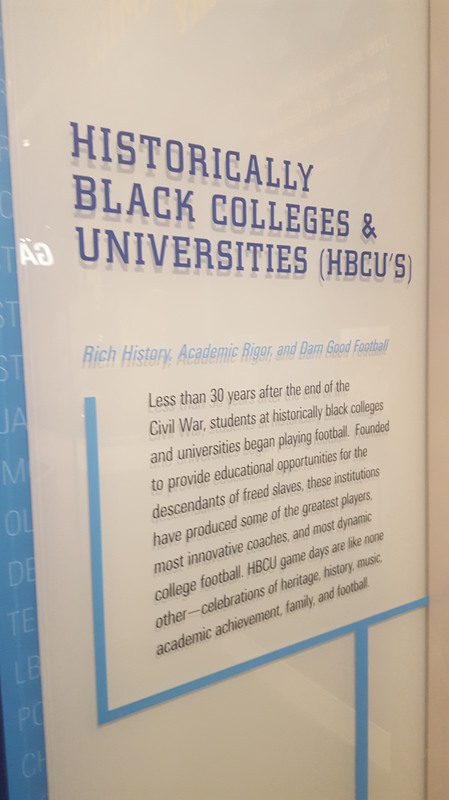 The one section that comes close to a broader social history is a small display about historically black colleges and universities, as well as a small display about “service” college football programs from the armed forces. 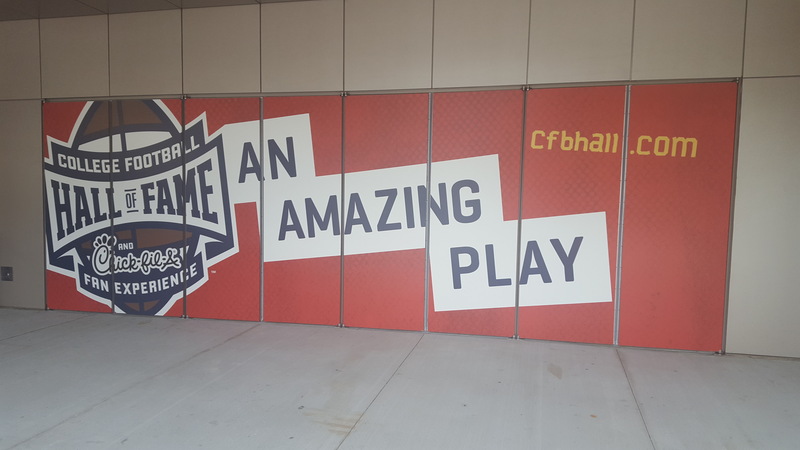 The top floor of the CFHF is the actual hall of fame itself – which is entirely digital – and a section about players who have gone on to great careers outside of football. 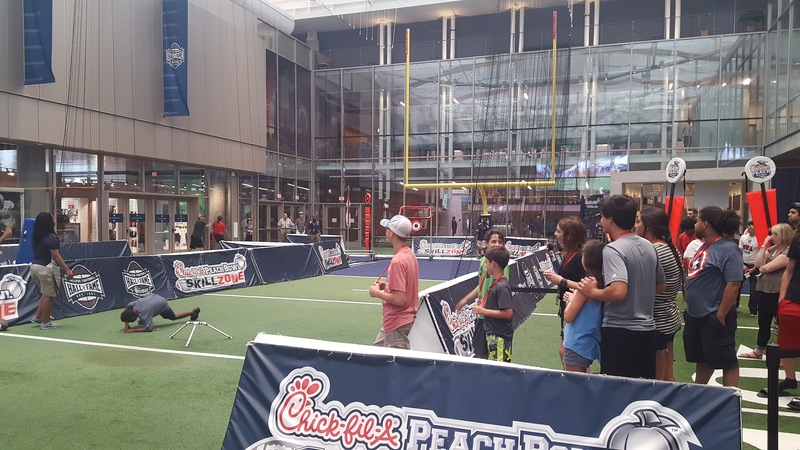 Finally, there is a large, indoor practice-type facility where visitors can try their football skills before exiting through the gift shop and back into Atlanta’s Olympic Plaza. The basic narrative of the CFHF could be boiled down to “College football is great, and it has created great games, great champions, and great men – both on and off the field.” I wasn’t expecting anything different, nor is it really set up to do anything different than celebrate college football. Again, most halls of fame aren’t particularly interested in broader social or political issues, and a visitor is not going to find much about race, gender, economic, or health issues at the CFHF. In other words, it does what it says on the tin, and is unapologetic about it. And, judging by the crowds that were there the day we visited, it is an unabashed crowd-pleaser and, it would seem, people broadly enjoy the experience. Of course, I believe this rather hagiographic approach is – broadly speaking, and not just for the CFHF – limiting. I think there is room for places like this to be, in the terms of the new museology, forums and not just sites of worship. And, I think that forum approach need not be just about some of the broader issues in college football and university athletics, but can be celebratory as well. From what I could see, there isn’t much space for temporary exhibits, nor did there appear to be any form of public, live interpretation or other form of programming. I think this is limiting, both in terms of the broad content and presentation of the CFHF, but also its broader appeal. In many respects, once you’ve “done” the CFHF, there are not many reasons to go back – at least for several years. It is possible that repeat visitation isn’t one of their major goals, and given that the CFHF is in the tourist district of Atlanta, right near the stadium that hosts numerous college football games that attract visiting fans, it may not need to attract regular repeat visitors. In some ways, it is set up to visit every three to five years, which may entirely meet their mandate. However, I’m just not sure there is much room to grow or change its galleries, and offer something new to the annual visitor. One of the other aspects that was pointed out to me – and one that I may have overlooked otherwise – was that the focus of the CFHF really is the “big time” college football programs, particularly from the South. Working at Clemson, we are one of those big-time Southern programs, so it all was instantly recognizable to me. However, I could understand how a college football fan from a smaller school or, say, a west coast university might not necessarily recognize the depiction of the sport and its traditions. I would also suggest that the digital approach, though interesting and interactive, also had its issues. Despite it being only two years old, many of the interactive displays were already showing some wear-and-tear, and several were down for maintenance. Furthermore, I found it difficult to find information not related to Clemson. While the personal curatorship was an interesting approach, it was a bit more challenging to find out about other athletes, games, and programs. As a visitor, I found it enjoyable enough, but I also have the real-deal of a big time college football program just steps from my office. I think it is a site that would appeal to both the dedicated fan and, possibly, might be of interest to someone wanting an introduction to the sport. In some ways, I could see it appealing to foreign visitors as a way of having an immersive American football experience on non-game days and in the off-season. As a heritage scholar, it is very much a corporate museum – a football museum celebrating football as a self-contained phenomenon. In other words, there wasn’t much about a broader context for developments in the sport and its traditions. The influence of corporate sponsorships were also a bit invasive (Kia branding throughout the tailgating exhibit, for example) and, I felt, detracted from the experience. Finally, if we are to understand heritage as the “present use of the past,” the CFHF celebrates all that is good about the college football experience, perhaps to mask the myriad of issues the sport currently faces – concussions and other health issues, sexual assaults committed by players and ignored by athletic and university administration, players’ labour issues, including unionization and pay, and the fact that college football coaches and administrators are almost always the highest paid employees on campus, to name but a few. By Gregory Ramshaw in Clemson, College football, football, museum, NCAA, sport, sport heritage, sport history, sport tourism, Uncategorized on August 19, 2016 .